Frank Stevenson is a partner in Locke Lord LLP and practices in the areas of real estate/finance and public law. Throughout his career he has represented financial institutions, owners, tenants, and others in the acquisition, development, leasing, financing, and sale of significant properties. In recent years he has increasingly focused on the representation of governmental entities in their project advancement and legislative activities. Stevenson is a former chair of the State Bar of Texas Board of Directors and a former president of the Dallas Bar Association. 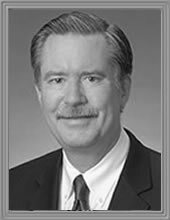 He serves on the State Bar’s Pro Bono Workgroup, the board of trustees of the Dallas Bar Foundation, and as a division chair for the Campaign for Equal Access to Justice. He has been honored by legal aid providers and received presidential citations from the State and Dallas bars. Stevenson was the founding chair of award-winning programs to mentor beginning lawyers and to diversify the profession. He holds numerous leadership positions with civic, charitable, arts, and educational organizations. He and his wife, Helen, have three grown children. Stevenson received a bachelor’s degree from Amherst College in 1977 and a J.D. from the University of Virginia School of Law in 1980.